Hewlett-Packard has added four new all-in-one PCs with Windows 8 to its portfolio, including the HP SpectreONE, which lets users control Microsoft's new OS with a wireless trackpad instead of touching the screen directly. 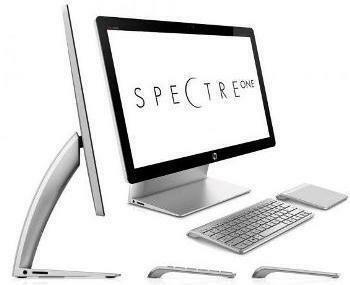 HP's new PCs, the SpectreONE, Envy 23 TouchSmart, Envy 20 TouchSmart and Pavilion 20, will compete with products from the likes of Acer, Lenovo, Samsung Electronics and Toshiba, which have already announced new all-in-one PCs running Windows 8, which will become generally available on Oct. 26. The SpectreONE is the top model among the products HP announced on Monday. It has a 23.6-inch full-HD display and is 11.5 millimeters thick, which makes it the thinnest all-in-one PC in HP's portfolio, the company said. The accompanying wireless trackpad, designed for the SpectreONE, has multitouch capabilities allowing users to scroll, swipe and tap their way through the new Windows 8 user interface. The SpectreOne also allows users to log in or transfer content by touching an NFC tag or NFC-enabled mobile phone on the base of the computer. The SpectreONE will start shipping in November in the U.S. and cost from US$1299. HP Envy 23 and Envy 20 TouchSmart PCs have touchscreens that can sense up to 10 fingers and allow users to navigate, type or play games on the screen, according to HP. Both the SpectreONE and the Envy TouchSmart PCs can be equipped with ExpressCache from Condusiv Technologies to speed boot-up and application start times, HP said. The HP Pavilion 20 is the simplest of the four new computers. It has a 20-inch non-touch HD display with an integrated HD web cam. The company expects to start shipping the Envy 23 TouchSmart and Envy 20 TouchSmart PCs in the U.S. in October at starting prices of US$999 and $799, respectively. The Pavilion 20 will also arrive in October and cost from $449. HP said it will announce more Windows 8 PCs, and a Windows 8 tablet made for business, in the coming weeks. Last month it revealed a tablet-laptop hybrid device running Windows 8, the Envy X2.